Fifty electric cars will begin tests of a wireless recharging system in London starting later this year. The tests are being conducted with the support of Transport for London and Mayor Boris Johnson. All that is needed for the system to work is a plate about the size of a tablet computer on the ground or a few centimetres beneath it, another plate on the underside of the car, a controller to turn alternating current into direct current and an in-car display - which can be integrated into the dash or a touch-screen - to show when the vehicle is lined up and charging has begun. For the moment, the car has to be static while charging takes place, but eventually wireless recharging points could be embedded in roads to give electric vehicles complete autonomy. Qualcomm, the company behind the system, says that wireless recharging would remove the clutter of plug-in posts from streets and parking areas and be vandal- and theft-proof. It is not the only company examining wireless recharging for electric vehicles, but claims to have stolen a lead on the competition because its system works over a wider air gap between the car and charging plate, even if the car is not perfectly aligned. 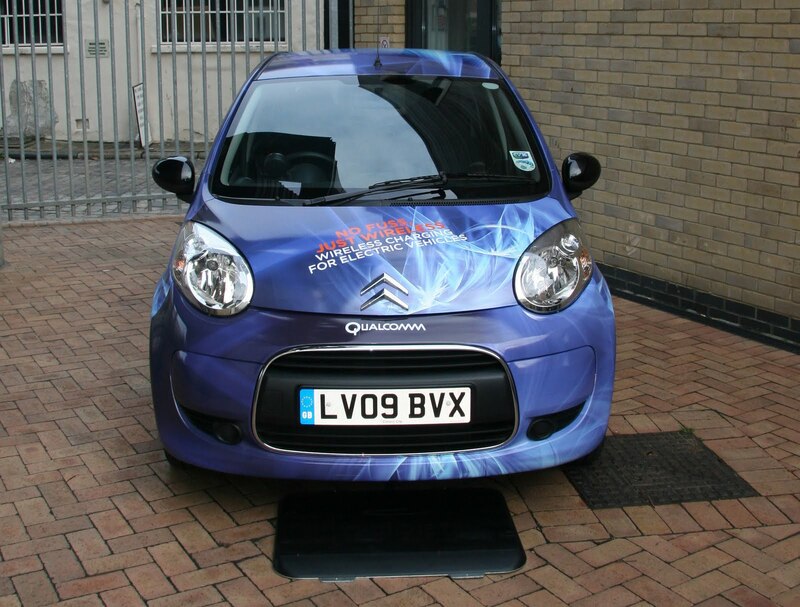 It is hoped that the data collected from this two-year programme will see the first wireless charging points being established in UK car parks and outside offices and shopping centres in 2014. Qualcomm is an American company whose European headquarters are in Chiswick, West London. It is the world's largest manufacturer of electronic chips - 1.2 million a day - and is also heavily into wireless recharging and in-car communications systems. The company's plan is to licence the technology to electric car manufacturers, and says it is already in discussions with many of them. It is also talking to the infrastructure company Chargemaster and Addison Lee, Europe's largest taxi operator, about more widespread adoption.